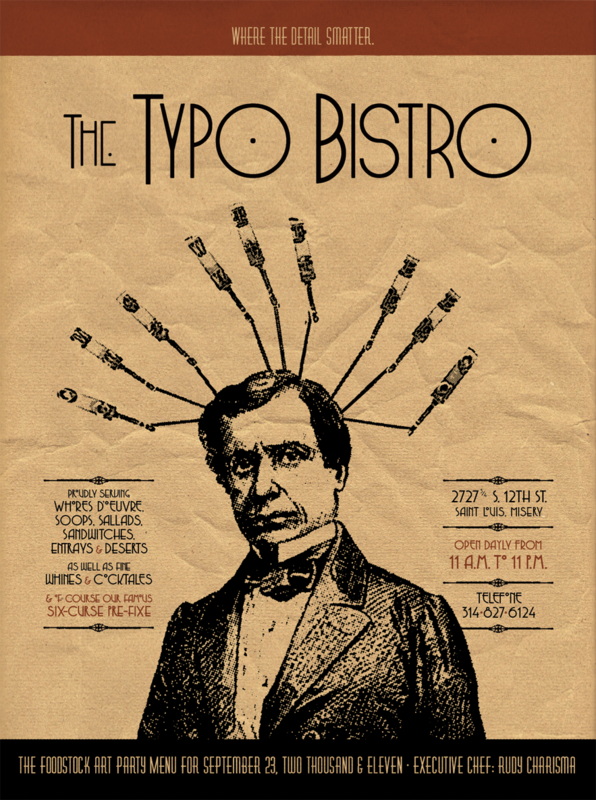 The Typo Bistro was a custom project that was auctioned at the Foodstock Art Party benefit in St. Louis, September, 2011. It is an entire menu for a made-up restaurant. Every item has a misspelling & every item is a bad pun, joke, or misinterpretation of one kind or another. Think a Grilled Cheese Sandwich sounds good? It does, unless you drop the “r” and end up with a Gilled Cheese Sandwich (that would be two whole fishes, grilled, with slices of American cheese between them—see the photo inside the menu). It is truly awful and somewhat offensive. Not just the sandwich, but the entire concept. The piece was a triptych printed on archival inkjet paper and mounted on wood. At the show at Mad Art Gallery, it was presented on the wall with a full table setting installation. Total overkill. But it made some money for Operation Food Search so it was for a good cause. Hat tip to Heath Harris for the accidentally inspiring this. The typewriter arms coming out of his head spell OMG WTF BBQ. See the whole thing here.